Gallstones are pieces of stone-like material that form in the gallbladder. The gallbladder is located near the liver and stomach. The majority of gallstones are made up of cholesterol. The rest are made up of bilirubin. Bilirubin is a breakdown pigment of the blood product hemoglobin. Biliary colic is the pain caused by a gallstone stuck in the bile duct, a tube that carries bile to the small intestine. 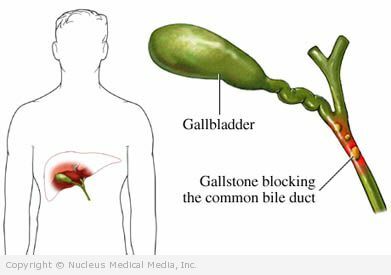 Sometimes, a stone caught in the bile duct causes cholecystitis (inflammation of the gallbladder). Cholangitis is inflammation of the bile duct caused by a gallstone or a bacterial infection. The gallbladder stores bile. This fluid is produced in the liver and used in the small intestine to digest fat. Bile contains cholesterol, water, bilirubin, and bile salts. Many people have gallstones without symptoms, called “silent gallstones.” In some cases, these are treated. Gallstones may cause pain in the upper abdomen. This is sometimes called an attack because it begins suddenly, often after a fatty meal. The pain is severe and may last for 30 minutes or several hours. Abdominal x-ray — a test that uses radiation to take a picture of structures inside the body, about 15% of gallstones can be seen on plain x-rays. Laparoscopic cholecystectomy — Laparoscopic cholecystectomy is the removal of the gallbladder through several small incisions in the abdomen. To view the gallbladder, a small, lighted tube with a camera is inserted into one of the incisions. Surgical instruments are used to remove the gallbladder through one of the other incisions. Open cholecystectomy — Open cholecystectomy is the removal of the gallbladder through a large incision in the abdomen. This is necessary if there is an infection in the abdomen or a great deal of scar tissue. Your doctor may give you medicine to dissolve small stones. You may need to take medicine for months or even years. Another procedure that may be used to treat gallstones is called endoscopic retrograde cholangiopancreatography (ERCP). ERCP uses a combination of endoscopy and x-rays to locate and remove gallstones before or during gallbladder surgery. Avoid rapid weight loss diets. Eat a diet low in saturated fat. Eat plenty of fruits, vegetables, and whole grain foods.